The Sikorsky S-61R is a twin-engine helicopter used in transport or search and rescue roles. A developed version of the S-61/SH-3 Sea King, the S-61R was also built under license by Agusta as the AS-61R. The S-61R served in the United States Air Force as the CH-3C/E Sea King and the HH-3E Jolly Green Giant, and with the United States Coast Guard as the HH-3F “Pelican”. The Sikorsky S-61R was developed as a derivative of their S-61/SH-3 Sea King model. It features a substantially revised fuselage with a rear loading ramp, a conventional though watertight hull instead of the S-61’s boat-hull, and retractable tricycle landing gear. The fuselage layout was used by Sikorsky for the larger CH-53 variants, and by the much later (though similarly-sized) S-92. Sikorsky designed and built an S-61R prototype as a private venture with its first flight in 1963. During its development, the US Air Force placed an order for the aircraft, which was designated CH-3C. The Air Force used the CH-3C to recover downed pilots. The CH-3E variant with more powerful engines would follow in 1965. The improved HH-3E variant would follow later, with eight built, and all 50 CH-3Es were converted to this standard. Known as the Jolly Green Giant, the HH-3E featured protective armor, self-sealing tanks, a retractable inflight refueling probe, jettisonable external tanks, a high-speed hoist, and other specialized equipment. In 1965, the U.S. Coast Guard ordered a version designated HH-3F Sea King (more commonly known by its nickname “Pelican”) for all-weather air-sea rescue. The Pelican featured search radar with a nose antenna radome offset to port, and water landing capability. Italian Agusta built a S-61R variant, named AS-61R under license. Agusta produced 22 helicopters for the Italian Air Force. The company claimed it could re-open the production line in 36 months to build additional AS-61 helicopters. USAF variants served in numerous air rescue squadrons and aerospace rescue and recovery squadrons of the Military Airlift Command (MAC), rescue squadrons of the Air Combat Command (ACC) and other USAF major commands worldwide. The aircraft was also used by a number of Air Force Reserve and Air National Guard rescue squadrons. All USAF HH-3Es, to include Air Force Reserve and Air National Guard, were retired in the 1990s and replaced by the current HH-60G Pavehawk. The HH-3F Pelican was a dependable workhorse for the US Coast Guard from the late 1960s until it was phased out in the late 1990s. All USCG HH-3Fs were replaced by the HH-60J Jayhawk and those aircraft have since been upgraded to the MH-60T Jayhawk version. Between 31 May and 1 June 1967, two HH-3Es of the United States Air Force made the first nonstop flight across the Atlantic Ocean by helicopter. Departing from New York in the early hours, the two helicopters arrived at the 1967 Paris Air Show at Le Bourget after a 30 hr 46 min flight. The operation needed nine in-flight refuelings. Both helicopters were later lost in combat operations in Southeast Asia in 1969 and 1970. Due to the nature of combat operations, particularly in Southeast Asia, many of the operational H-3 crews received honors and awards. The highest American military award, the Medal of Honor, was awarded to Captain Gerald Young, USAF, on 9 November 1967. Young piloted an HH-3E, AF Ser. No. 66-13279, of the 37th Aerospace Rescue and Recovery Squadron in an attempt to rescue a US Army Special Forces reconnaissance team trapped by enemy fire in Laos. When his aircraft was shot down, he escaped the burning wreckage and, despite severe wounds, evaded capture for 17 hours until being rescued. As a result of Captain Young’s efforts, the other survivor of the crash was ultimately rescued and the bodies of those servicemembers who died were also recovered. Military transport helicopter, Sikorsky model number. Prototype operated by Sikorsky and first flown 17 June 1963. One aircraft for the Argentine Air Force to HH-3F standards. Long-range military transport helicopter for the US Air Force, 75 built. Long-range military transport helicopter for the US Air Force. 41 converted from CH-3C, plus 45 newly manufactured. Long-range search and rescue helicopter for the US Air Force, 50 converted from CH-3E. Special Operations version for the US Air Force. US Air Force VIP transport helicopter. 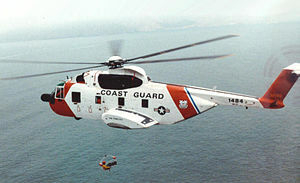 Long-range search and rescue helicopter for the US Coast Guard, 40 built. Long-range search and rescue helicopter built since 1974 under license in Italy by Agusta, 22 built.